I have no recollection of when and where I picked up this record. It was definitely some time after its release date of 1995 (or, specifically, 14 August 1995 as an associated insert confirms); instinct suggests it was at some point during the last three or four years from now. What I mean by that is that I remember it not being part of my collection, and I also remember it being so. My mind triangulates the change from one state to the other as being in the realms of ‘quite recently’, rather than ‘very recently’, ‘ages ago’ or something else. Music venues releasing records: Leadmill Records was run by the Sheffield Leadmill venue, which is trumpeted on the back cover as Melody Maker’s 1994 number one live venue/club in the UK. How many other venues have released records? What makes the people running and booking bands at a venue decide to release records? Does this only happen when things are going extraordinarily well and there’s enough money flying around to plough a grand or two into a vanity project? The use of the word ‘still’: The aforementioned trumpeting back cover blurb starts by saying ‘The Leadmill is still a live music venue & club based in the heart of Sheffield…’ Why still? Was it once not going to be a venue? Does the word suggest a wearied acceptance that this building is always going to be a venue, whether we like it or not? 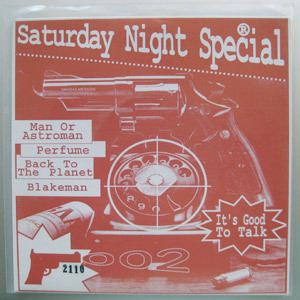 Choice of bands on the compilation: The bands on this compilation are Man Or Astroman, Perfume, Back To The Planet and Blakeman. MOA and BTTP are (or at least were) well known bands at the time; Perfume and Blakeman, not so much. Blakeman are the subject of the record’s insert, an A6 postcard which includes the band’s contact address as… The Leadmill! So – who were they? The Leadmill house band? Promoters at the venue? The bankrollers of this record? Strange record side naming: Instead of Side A and Side B, or Side 1 or Side 2, this record’s sides are referred to as ‘maureenlipmanside’ and ‘bobhoskinsside’. What the hell is that about? What does it mean? Awful cover art: Who saw this cover art and thought ‘yes! that’s it! that’s exactly what our record needs!’ – apologies to whoever put it together, but I think the cover is horrific. Confusing and unattractive. Why a gun? Why a target over a telephone dial? Why ‘It’s Good To Talk’? In capitalised words? My favourite out of the bands on here is Man Or Astroman. They’ve long been on my list of ‘bands I should buy loads of records by’. All I have beyond this track is a taped copy of one of their albums. I used to play that tape a lot and whilst the combination of surf-style garage rock and 1950s science fiction samples may sound cheesy and not fun, I remember it being – to use a word I’ve never used before – hella fun. Hey can you burn me a copy of this ? Are you still sending me those tracks? Just a reminder. Cool I totally understand sometimes people do actually forget,so I gently remind them from time to time. Until then!